To celebrate Bahrain's tenth anniversary as an F1 Grand Prix host, they opted for a night race, and boy did the action under the floodlights deliver! From the moment the start lights went out, there was wheel to wheel action between teammates and throughout the grid. We saw a handful of silly accidents, a penalty or two, and the safety car came out. Tyre strategy was part of it, team orders didn't really make any difference, and the fight went from the very first corner right to the finish line. If you missed any of the action today or want to check up on a specific lap, then this Factbyte Factbox replay may be of use. Hello there F1 friends, we're just half an hour away from the Bahrain Grand Prix, and this is the place to be to get all the information you need! It's a weekend that has been dominated by Mercedes, the third in a row, but there is so much else to take note of, it almost doesn't matter. Nico Rosberg secured pole position yesterday, but behind him, Daniel Ricciardo was third before taking a ten place grid drop. That puts him back down in 13th, behind his teammate, who dropped out of qualifying in the second session. There's a frisson of excitement surrounding the Williams of Valtteri Bottas and the Force India of Sergio Pérez, as they now start third and fourth respectively. This is Bahrain's first night race, a celebration of their tenth anniversary hosting a Formula One Grand Prix. So far, it makes it look just like Abu Dhabi. The tyres on offer today are the medium and softs, white and yellow sidewalls respectively. Ricciardo isn't the only driver to have a penalty this weekend, Adrian Sutil was given a five place grid drop for impeding in qualifying. That puts him right at the back of the grid. Daniel himself says he's just using the penalty to motivate himself, hoping to get a good result, put it behind him and "make me stronger." Claire Williams: "The conditions do suit us, the tyres are okay here. I hope we’ve got a good strategy. We’ll just have to wait and see, but those Mercedes are so far ahead, and there’s so much competition behind as well." The sun is setting over the track, as the floodlighting really starts to take effect. Anniversaries galore, 900th Formula One Grand Prix race, 250th race for Jenson Button, and 150th for Toro Rosso. Force India also celebrating this weekend. Kimi Räikkönen has reportedly had some turbo problems pre-race, with the team having to make repairs ahead of the start. 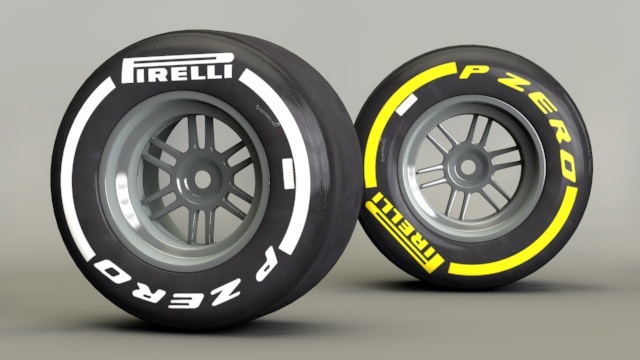 The only drivers starting on the medium tyres are Vettel and Sutil, everyone else is opting to start on the soft (yellow) tyres. The grid has cleared of mechanics, the tyre warmers come off, and the formation lap is about to begin. Nico Rosberg leads the pack away, Lewis Hamilton got off to a slow start but not as bad as Sergio Pérez. The Force India was stationary for a moment or two, before finally pulling away. He'll be able to make up his position again on the way round. Rosberg weaves massively as he rounds the final few corners before retaking his position on the grid. As they crawl to their respective grid slots, Rosberg pulls away and Hamilton backs everyone up, taking his time to get to his second place position. Rosberg is slow off the line, Hamilton pulls alongside and then takes the lead into the first corner. Sergio Pérez had a huge lockup into the first corner, smoke pouring off that car - those tyres will be wrecked already. Nico Hülkenberg is locking up now as well, the Force India drivers struggling a little on the first lap. Jean-Éric Vergne has slowed to a crawl with a right-rear puncture. He's got to make his way back to the pit now, a long way to go. Räikkönen has dropped back to ninth, with Fernando Alonso managing to make his way past him for seventh - Hülkenberg splitting the Ferrari pair. Felipe Massa has surged forward to third, somehow, with Bottas dropping back behind his teammate and Pérez for fifth. Vergne made it back to the pit lane, it's a slow stop for the car but he's on his way again. Team radio from Vergne: "Hit by a Lotus car. I don't know who it was, absolutely mental." Yellow flags and they're gone almost as quickly as they arrived. Hamilton leads Rosberg at the front, then, with Massa behind them in third. Magnussen has dropped out of the top ten, sitting behind Vettel for 11th. The start replays show that Massa just had an incredible start, narrowly avoided contact with Pérez, and swept forward for that third place. Tweet from @clubforce: Looks familiar? Nico battling Alonso for the third race in a row! More replays, we've got Ricciardo being pushed off track twice in the first few corners. He's currently in 12th place, having started 13th. Vergne switched to the medium compounds in that early stop. Hülkenberg has sailed past Alonso, it looked supremely easy as Fernando radios: "We don't have the power to keep him behind." Jules Bianchi leads the battle of the back markers, currently 17th with two Caterhams behind. Sutil is 20th, ahead of Chilton, with Vergne bringing up the rear. 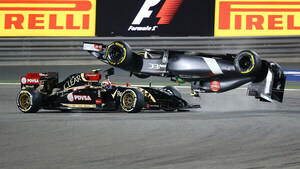 Pastor Maldonado overtakes Esteban Gutiérrez, sweeping forward to take up 14th place. Ahead of him, Daniil Kvyat in the Toro Rosso. Adrian Sutil comes in for a super quick stop, he's used up the medium tyres now and takes on the softs. At the front, Hamilton has a 1.5 second gap over his teammate, but the pair have about 8 seconds over everyone else. Ominous! Ricciardo attempts a move on Magnussen but mistimes it and runs wide off track. The loss of momentum allows Kvyat to close up. The Toro Rosso takes on the sister car, but doesn't quite make it. This is the fight for 11th place, as drivers are desperate to get into the points. Side by side for Jenson Button and Valtteri Bottas, as Button squeezes his way past. Nico Hülkenberg takes the opportunity to move past as well, Bottas dropping back two places in just a couple of corners. Bottas dives into the pit lane, with Kvyat and Bianchi also in this lap. Pastor Maldonado has been told his pace is good and they're sticking to plan A.
Ricciardo managed to close the gap on Magnussen again, he ducks and dives to get past the McLaren and finally makes it past to take tenth place. Both Red Bull drivers into the top ten now, with Vettel just ahead of Ricciardo in ninth. Sergio Pérez muscles his way past Felipe Massa for third, the Brazilian tries to come back on the Force India, but can't make it. Yet. Fernando Alonso and Esteban Gutiérrez both pit, falling way down the order as they do so. Plenty still to stop ahead of them though. Sutil has spun off track, the yellow Pirelli markings have rubbed off one of the tyres. He may have hit the wall. Replays show it was a couple of battles with Bianchi, firstly rubbing wheels with the Marussia until the paint comes off, then a collision that resulted in a puncture for the Frenchman. Sutil has dropped to the rear of the field again but is still running at the moment. Vettel complains on the radio that his DRS isn't working. Ricciardo closes up to his teammate, who is on the back foot with no DRS. They've got to be careful, the pit wall will be watching on carefully. Turn 1 incident involving Adrian Sutil and Jules Bianchi under investigation - causing a collision. Team radio from Daniel Ricciardo: "We're losing time like this. We've got to decide what to do." Team radio to Sebastian Vettel: "Let Daniel through, please. Daniel is quicker than you." Nico Hülkenberg pits, taking on some more soft tyres. Nico Hülkenberg came out from his pit stop with fresher tyres behind Kimi Räikkönen, who in turn was tucked up behind Daniil Kvyat. The Force India got past them both and scampered away in ninth place. Moments later, Räikkönen passes Kvyat, moving into 11th place. Rosberg gets racey with his teammate, attempting to overtake Hamilton. He ran wide a little into the next corner allowing Lewis back through into the lead. Jenson Button comes in for his first stop of the day. Rosberg complains on the radio that the move "is not on" but replays show it was pretty fair racing. One lap later, an exact replay of the same move. Rosberg makes it stick this time, as they both lock up into the first corner. It's side by side, corner after corner, as Hamilton is desperate to get the lead back from his teammate. Fantastic driving from these two! Rosberg held on to his lead for only a few corners before Hamilton stormed back in front. They're still desperately close though, and they're coming back round to that first corner again. Hamilton rounds the corner and dives into the pit lane, it's a super quick stop from the Mercedes crew, and he's on his way again. Both the Force India drivers have managed to get past Fernando Alonso, with Hülkenberg 5th, Pérez 6th, and Alonso now 7th. Nico Rosberg is the only driver not to have come into the pit lane now. Hamilton has his theoretical lead in tact. In the top ten, Fernando Alonso looks to have used the most fuel so far, with Nico Rosberg the least. All are within the 34/35% range. Jenson Button makes a very tight move on Kimi Räikkönen to take 8th place. Looks like Adrian Sutil and Jean-Éric Vergne have both retired from the race, a lap or two ago. Rosberg comes in for his pit stop, coming back out in second place, with medium tyres on. Hamilton is ahead on the softs. We've got two Mercedes drivers in the lead, battling each other. Behind them, Valtteri Bottas and Felipe Massa for Williams. And behind them, Nico Hülkenberg and Sergio Pérez for Force India. Team by team, again. In a reverse of the racing in Malaysia, Bottas is now holding up Massa, who complains on the radio that he's losing his rear tyres. The Williams and Force India four are all so close together, this is going to come to blows any second now. Vettel takes the inside line to move up to ninth, leaving Kimi Räikkönen in his wake. Massa moves alongside Bottas, but has to back off. A couple of corners later, he does it again. This is a teammate pair with no love lost, too. Meanwhile, Hülkenberg is hugging the rear wing of Massa, ready to take any opportunity that comes his way. Team radio from Bottas: "I would like to box now, if possible." Bottas swings into the pit lane, releasing Masa. But will he have the speed to hold off the Force India pair now? He holds Hülkenberg off into the first corner, but the German is hounding that Williams. As Hülkenberg lost time backing off from Massa, Pérez took the opportunity to dive ahead of his teammate. Force India on Force India now! Pérez makes the move on Massa, who in turn locks up and lets the Force India past. Hülkenberg gets better traction out of the next corner and goes round the outside of the Williams. Down two places for Massa this lap. Massa tries to recover his position, but he hasn't got the pace to keep up with the two in front. He dives into the pit lane to take on fresh tyres. At the same time, there's a great battle ongoing between Daniel Ricciardo and Kimi Räikkönen, with the Finn staying ahead in 7th place. Team radio to Gutiérrez: "Kobayashi is most likely two-stopping you need to overtake him on track." Valtteri Bottas closed in on Räikkönen, and the Williams driver had to avoid the Ferrari when Kimi braked earlier than expected. Bottas ran wide off track but continued. Bottas' radio asked him what happened, and if they needed to get in touch with race director Charlie Whiting, but it looked like it was just a mistake on Valtteri's part. Finally, Daniel Ricciardo gets past Kimi Räikkönen, leaving it to Bottas to close up on the Ferrari again. Bottas takes the inside line and makes the move on the Ferrari, taking eighth place. Tweet from @MercedesAMGF1: Forgive us for going all nerdy, but what a race we've got here! Epic battles throughout the entire field, that's what #F1 is all about! Bottas is now hounding Ricciardo for position, with Massa closing up to his teammate again. Bottas makes the pass on the Red bull, moving up to seventh and leaving Ricciardo in the clutches of his teammate. Kimi comes in for his second stop of the day. Down the home straight, with the help of DRS, Massa sweeps past the Red Bull of Ricciardo. A handful more drivers head in for their second stop. Sergio Pérez pitted and rejoined just behind Fernando Alonso but takes only one lap to get past the Ferrari - now in eighth place. Marcus Ericsson has stopped just off track. Our third retirement of the day. Sebastian Vettel swept past Pastor Maldonado in the second DRS zone, unsure if his DRS is now working or not because he made it look easy but then again... it's a Lotus. Maldonado, and the two Mercedes up front, are the only drivers not to have come in for their second stops yet. Ricciardo is on the charge we thought he would have at the start of the race. He's just passed Kimi Räikkönen and makes short work of Kevin Magnussen and Pastor Maldonado. The Red Bull moves in to tenth place. The Williams battle will be on again very shortly. Close up replays show Vettel's DRS is working. The Williams battle is off, as Massa pulls in for his third stop of the day. At the rear of the field, Kobayashi has moved to the front of the backmarker battle, leading Chilton and then Bianchi. Kimi Räikkönen makes an easy move to overtake Pastor Maldonado, who very quickly dives in to the pit lane for his second stop of the day. Team radio to Magnussen: "We'll be racing Maldonado at the pit exit." Accident between Pastor Maldonado and Esteban Gutiérrez, with the Sauber stopped out on track with significant damage. Replays show Pastor Maldonado exits the pit lane. Gutiérrez had no idea he was there, turns to take his corner and is punted in the side by Maldonado. The car spins totally round, upside down, and lands right side up. Esteban talks and climbs from the car, although the medical car has gone out to check up on him. Both the Mercedes drivers pitted when the safety car call came. Ferrari have also had both their drivers come in for their third stops. Kevin Magnussen pulls to a halt off track, the McLaren car is smoking gently. With their pit stops, we've now got Hamilton on medium tyres and Rosberg on softs. Lewis would have hoped to be way out in front by the time he needed to use the less favourable tyre. The safety car will not work in his favour. Reportedly a clutch failure on the McLaren of Kevin Magnussen, our fifth retirement of the day. Rosberg was asking the pit wall if he should/could/would burn fuel behind the safety car, as they've saved some during the slow period and he doesn't want to be too heavy towards the end of the race. Lapped cars are overtaking now. Everyone that is still running doesn't HAVE to stop again, having used both compounds. Whether they will or not in the final 12 laps, remains to be seen! Turn 1 incident involving Pastor Maldonado and Esteban Gutiérrez under investigation - causing a collision. Team radio to Lewis Hamilton: "Lewis, it's Paddy. With ten laps left to go, can we just make sure we bring both cars home." Nico gets exactly the same message. Tweet from @WilliamsRacing: SC in this lap and our guys on fresher tyres than most.... Let the racing resume! Track is clear, the safety car is gone, and the Mercedes pair are dicing into the first corner. It's the Force India duo who go wheel to wheel, though, with Sergio Pérez getting past into the first corner. They're still at it, as the Mercedes pair also close up. 10 second stop/go penalty for Pastor Maldonado - causing a collision. Vettel passes Jenson Button, with Daniel Ricciardo through just as quickly. Button down to 7th. Rosberg is still on the back of Hamilton, but he needs to do it quickly before Lewis' tyres are up to temperature. Massa passes Button into the first corner, and then Bottas makes his way through as well. The safety car period has not worked in Button's favour. Maldonado files into the pit lane for his ten second penalty. Hamilton complains over the radio that he has no power, but then sets the fastest lap of the race so far. Button is now in front of two Ferrari drivers... but probably not for long, as Alonso is lining him up for a pass. Hamilton stretching the lead to Rosberg now, just about 8 tenths up on his teammate. Alonso locks up, allowing teammate Kimi Räikkönen to close the gap considerably. Ricciardo makes a pass on Sebastian Vettel, snatching fifth place from his teammate. Vettel tries to take the place back but the Australian has the inside line into the next corner. Mercedes, showing just how fast they are, have clawed out 11 seconds on the rest of the field already. Fernando Alonso makes the pass on Button, taking ninth place. As expected, Kimi Räikkönen also gets ahead. Button has absolutely nothing to fight with in these late stages. Vettel is still hustling his teammate, ducking around the Red Bull, desperately trying to find a place to get back ahead. Rosberg dives down the inside to take the lead, but Hamilton sticks in and takes his place back. They are side by side AGAIN, blatantly ignoring Paddy Lowe who must be having a heart attack. Five laps to go as the Mercedes pair cross the line. Just as before, Rosberg dives forward into turn one but runs wide and lets Lewis back through again. The world feed is dedicated to the Mercedes battle. Behind, Daniel Ricciardo has passed Nico Hülkenberg for fourth place. If he can get past Sergio Pérez, just a few seconds up the road, he'll be in line for a podium! Vettel has Hülkenberg in his sights now, looking to move up to fifth place. About four tenths of a second between them at the moment. Vettel locks up hugely, narrowly avoiding crashing into the back of the Force India ahead. Hamilton has clawed the gap on his teammate to about a second now, he might be breathing a little easier in the lead. The Williams battle is on again. Bottas close up behind Massa as they fight for 7th place. Jenson Button is slowing on track, he's still rolling but must be headed for the pit lane. Disappointing end to his 250th race. Massa tussles with Vettel, with the Red Bull pushing him wide off track. Massa briefly gets the position but Vettel sweeps back ahead with the momentum. Button does pull into the garage and retires from the race. Final lap. Poor exit for Massa in the early corner allows Bottas to have a look, but he settles in behind. Lewis Hamilton wins the Bahrain Grand Prix! Huge smiles on the pit wall, it's impossible to describe the relief they're showing! Pérez holds off Ricciardo for a podium position. And Massa holds off Bottas to finish 7th and 8th respectively. On the radio, Hamilton thanks his team, saying they didn't have the pace on their side of the garage, but they held on to the victory. Niki Lauda: "Anyone who claims this sport is boring is an idiot." Max Chilton finished 13th, which is a) his 22nd consecutive race finish out of 22 starts and b) a position that pushes Marussia back up above Caterham in the standings. Both still on zero points though. Force India claim their second podium position, the first in Belgium 2009. Big hugs for the Mercedes duo in the podium green room. "That was so close!" Hamilton says. Back-slapping between the pair, and huge smiles for some great racing. The three boys head up to the podium, Aldo Costa takes the step reserved for team representative, and the national anthems play out. Tweet from @OfficialSF1Team: According to first checks in the medical center @EstebanGtz is ok. Precautionary examinations will follow in the local hospital. Hamilton heaves the huge trophy into the air, big smiles from the race winner. The rose water is sprayed, it's not quite as bubbly as champagne, but all three drivers aim it at Aldo Costa. Podium quotes - Lewis Hamilton: "It’s great to see that we have such a great crowd. I’m so grateful for the team for working so hard to get us up here. It’s my first time winning here in Bahrain, it’s taken me a long time, I’m so proud. It was exciting, Nico drove fantastically well. Very fair, and it was very hard to keep him behind, particularly at the end… It was great fun and of course a great relief when I got across the line." Podium quotes - Nico Rosberg: "I strongly dislike coming second to Lewis, that’s not something I enjoy doing. On the other hand, it was the most exciting race I’ve ever done in my whole career… I think today was a day for the sport, we put on a massive show as team Silver Arrows. I’ll be back next race to take the win." Podium quotes - Sergio Pérez: "It’s been a while since my last podium. This podium is very special for me. It’s only my third race with the team, a really good one. The strategy was really close for us. It was looking a lot easier until the safety car came... We managed to keep it, I think one more lap I wouldn’t have managed to keep it." There's champagne (and/or rose water) flowing in the Mercedes garage, as Paddy Lowe explains his radio message wasn't a coded team order but just a reminder that they are teammates and they do want the points. Forgive the crush but hey, you saw how close it was. A terrifying shot of the incident between Gutiérrez and Maldonado. Thank goodness Esteban is okay, and this is something that will no doubt be looked at closely post-race. Two double DNFs in a row for Sauber, whilst Lotus finally managed to get both of their cars across the line. 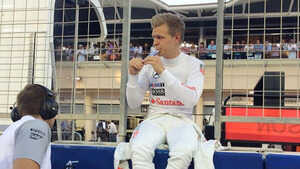 Nico Hülkenberg: For the team a great day, great achievement. I’m vert happy for the team. Also contributed my bit, was fighting off Ricciardo for so long, otherwise probably would have a go at Checo as well. Tricky race, lot of fighting, lot of battling. There was an incident with Felipe where I think he wasn’t so fair… considering where I came from, think a great race for me today and a great result for the team. Force India move into second place in the team standings, an impressive start to the season for the Silverstone squad! That has to be the most exciting race I've covered here on the FBFB. Was it really Bahrain? Turning it into a night race should have happened years ago! It was exhausting and brilliant in equal measure just watching, goodness knows how those drivers battling on track felt. The Mercedes dominance continues to be clear for all to see, but if it gives us wheel to wheel action like that, I'm okay with it. There'll be plenty of wrap up across the site over today and the next few days, so stay tuned for more great F1 fun! Thanks for following along this weekend. 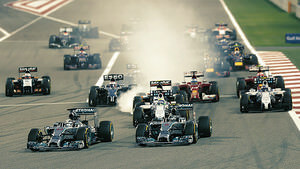 Formula One takes its traditional fortnight off now, so we'll be back for the Chinese Grand Prix in two weeks!